Carson Wentz was uncorking bombs during pregame warmups. MINNEAPOLIS – It wasn't that long ago that Carson Wentz was hobbling around with crutches during pregame warmups, and then a cane. 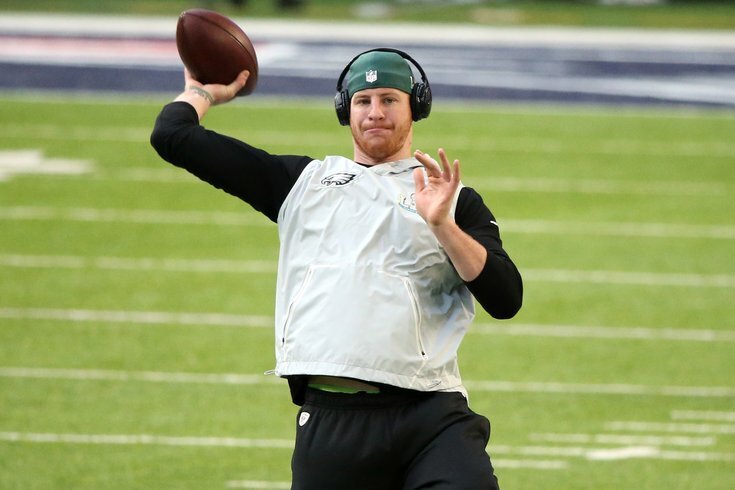 During warmups for the Super Bowl, Wentz was playing catch with some Eagles employees. Wentz has a long road to recovery ahead for a torn ACL that he suffered against the Los Angeles Rams Week 14, but there's nothing wrong whatsoever with his arm strength. Here he is lofting a lollipop close to 50 yards in the air. Prior to this video, he was ripping 50-yarders on a line off of his back foot. Wentz told reporters a couple Fridays ago that he will be ready for the start of the 2018 regular season.We'll see, but it's an encouraging sign that he is able to move around a little and throw the way that he is above.